We decided to cancel our plans to go to Phu Quoc, a Vietnamese island off the coat of Cambodia, when we heard it was really just another island with walled off 5-star resorts and garbage strewn beaches. Sounded too much like Bali. But, where to go? We have always had Myanmar on our list. The old Burma is suffering through a recurring nightmare of bad politics and human rights abuses. The treatment of the Rohingya, a race of people who have been in Myanmar for over 200 years, is beyond sad. Of a population of 1.25 million, 840,000 are now refugees in Bangladesh next door. These people have never been given resident status and are being persecuted at the hands of the military government. However, there are 53 million people in Myanmar and tourism, one of their mainstay earners, is in the tank. We could justify that helping them a bit doesn’t endorse what their government is doing. 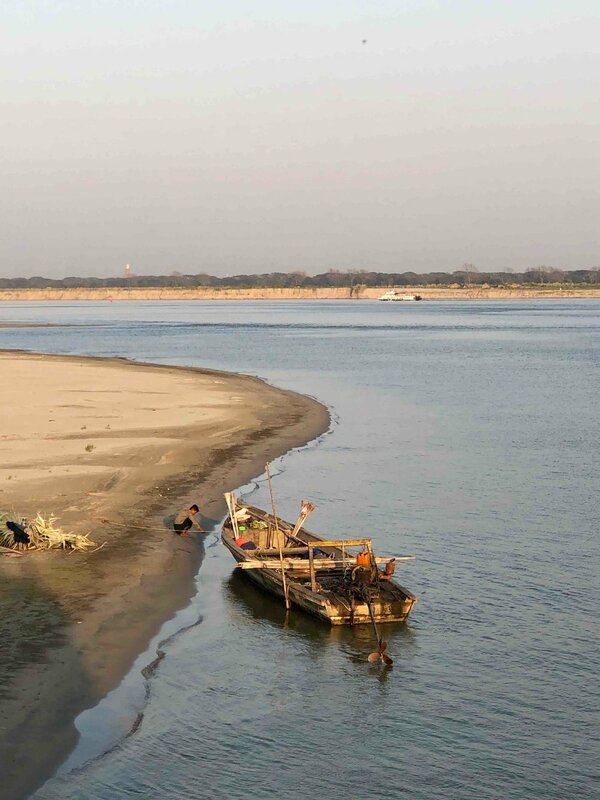 The Irrawaddy River flows south touching exotic stops like Mandalay and Began. The Strand Hotel in Yangon, built in 1901 and then bought by the Sarkies Brothers who built the E&O in Penang and Raffles in Singapore, was completely renovated a few years ago. Only 31 rooms, each comes with your own butler. They also own a river cruise boat called the MV Strand that cruises the river from Mandalay to Began. The Strand packages the trip in such away that all local flights, car pickups, etc. are on one bill. DAY 1: We flew to Yangon via Bangkok’s old Don Muan Airport. The one that has a golf course between the runways. Picked up in a BMW 740 with massage seats, it was the first pleasant surprise of Myanmar. DAY 2: VERY early the next morning, our butler served us lobster omelettes in our room and we were off to the airport in the Bimmer for the short flight to Mandalay, Myanmar’s second largest city and its last royal capital. We gathered at U-Bein Bridge, a teak structure crossing the Taungthaman Lake made of recovered wood from the Royal Palace in 1850. The bridge is believed to be the oldest and longest teakwood bridge in the world. With over 1,000 teak support pillars, it is over 1.2 KM’s Long. Nice, but just a wooden bridge at the end of the day. A tour of the Mahamuni Pagoda revealed a golden Buddha constantly being dressed with paper thin gold leaf by the devotees. As a result, pictures from 20 years ago reveal his delicate hand has been gilt with so much gold to the extent he looks like a golden ‘Hell Boy’. Next up, the Kuthodaw Pagoda or Paya is home to the world’s largest book. The central shrine is surrounded by 729 smaller pagodas and each one houses a marble tablet, inscribed with writing from the Buddhist holy book known as Tipitaka. Near the Pagoda, the ladies were making ‘Thanaka’. The beige paste made from grinding a special tree bark on a stone with bit of water. It has fragrant scent somewhat similar to Sandalwood and gives you a cooling sensation. Every kid and most women use this on their cheeks and nose as sun protection and have done this for 2,000 years. Then finally, we boarded our boat and had an orientation by the Captain and crew. The Strand is a flat bottomed boat with 28 cabins. It has a pool, a lovely bar and dining room, a store (more about that later ) and lots of outdoor open space plus a small spa. It looks a bit like a Mississippi River boat without the paddle wheel at the back. On boarding, we learned that of the 28 cabins only 7 were going to be occupied. Such is the state of tourism in Myanmar. These days the boat is never more than half full. But, that allowed us to bid for upgrades to one of the two first class cabins in the bow of the boat. Living room with flat screen TV, separate bedroom and private terrace at the bow. Oh yes, had to have that! The chef is Thai and prepared an excellent Thai lunch. By that time we had met most all of our fellow passengers. Linda and daughter Victoria from Belgium Edwin and wife, originally from Hong Kong, now residents of San Diego, a Greek family of 5, also from Belgium but living in Singapore, a very funny Aussie couple. Good mix. While we skipped the afternoon tour, we did spark up for the torch-lit beach bbq on a sandbar. Very good food and we got to know our 11 compatriots as our entire boat complement sat at one table. DAY 3: Next morning we dock at Ava, the ancient imperial capital of successive Burmese kingdoms from the 14th to 19th centuries. A once prominent city, Ava has been ravaged by war and natural disasters and rebuilt numerous times. Today, all that is left are the ruins and remains of an abandoned kingdom forever imprinted in history. We travel back in time in horse-drawn carriages through banana plantations to visit Bagaya monastery made completely of wood/teak and the Queen's Brick Monastery. Back on the boat, there is a cooking class that taught us how to prepare a simple pomelo salad with fresh shrimp and how to make and apply Thanaka. Finally, a demonstration of how to wear the ‘ Longyi ‘, the sarong all men wear. To our surprise, at least 20 different ways. The afternoon is spent cruising down river until docking outside of Bagan. I tried the pool but they keep it freezing cold while the outside temperature is over 40 degrees. Dinner lovely again. DAY 4: Our last day we stay docked in Bagan and tour the impressive Ananda Temple, one of the most exquisite temples of the country and the Htilominlo Pagoda. After lunch back on the boat, the temple trek continues - Shwezigon Pagoda then Gubyaukghi Temple before a stop at a lacquer workshop (Bagan Shop). Incredible how they hand strip dried bamboo, form it, shape it, treat it with lacquer of all possible colours and then etch or draw intricate designs before drying them in a basement complex. Outside is so humid the lacquer would never dry. I tried to negotiate to buy a ‘Stupa’ but could not get them down from $200 US to anything below $135. Edwin, our shipmate, reminded me the boat store had beautiful ones for a lot less. On returning, we found from the ship’s master that their lacquerware was some of the best in the country and I bought a beautiful blue, etched Stupa for $52 bucks! That night there is a “Myanmar Traditional Cultural Show” in the open terrace bar with dancers in costume, puppeteers (they love puppets here) and lots of singing, music and carrying on. Baked by the heat, it’s an early night before departing for Began airport after breakfast and our flight back to Yangon. DAY 5: Picked up again in The Strand’s 7 Series BMW with the massage seats, we had dinner at ‘Le Planteur’ on a lake about 100 yards from Aung San Suu Kyi’s residence. No protests but a few guards with guns hanging around. Dinner, with the Belgium Mother and Daughter, was very good set off by an enormous silver bucket on a trolley holding at least 20 bottles of white wine and champagne. My Risotto Parmigiano, with scallops smoked right at your table, and white and green asparagus was the best I’ve every had, anywhere. DAY 6: We set off in the morning for the Bogyoke Market. Built under British rule in 1926 was then called Scott’s Market. It is a lovely, clean and bright place selling everything from gold and precious stones to T-shirts and carvings. There, I bought my own Thanaka and grinding stone. Dinner in the bar at The Strand and off to the airport the next morning for Bangkok and home. A great trip! The boat and the hotel of the same name were lovely. The boat is spotless and kept that way by taking your shoes and cleaning them every time you come aboard. Terrific staff, wonderful food and all the people we met were friendly and welcoming (and yes, they do want your money and please, don’t everybody sell just postcards. Something else would be nice). After I bought one, I sent every kid who came after me to Edwin who found it impossible to say no. He now has a lifetime supply of Myanmar postcards. There are other boats but only The Strand can put together such a complete package. DAY 1: Fly Air Asia to Yangon via Bangkok’s old Don Muan Airport. Stay at The Strand Hotel. DAY 2: Fly from Yangon to Mandalay. Meet at the famous U-Bein Bridge then continue to the Mahamuni Pagoda. Then board the Strand boat. DAY 3: Arrive in Ava to visit Bagaya Pagoda and the the Queen’s Brick Monastery. DAY 4: Arrive in Bagan to visit Ananda Temple, one of the most exquisite temples of the country and the Htilominlo Pagoda. Followed by Shwezigon Pagoda and Gubyaukghi Temple. Then visit a lacquer workshop, Bagan House. DAY 5: Fly from Bagan to Yangon, stay at The Strand. Dinner at Le Planteur. DAY 6: Visit Bogyoke Market. Dinner at The Strand. Our Belgium shipmates raved about Seeds but it was fully booked.